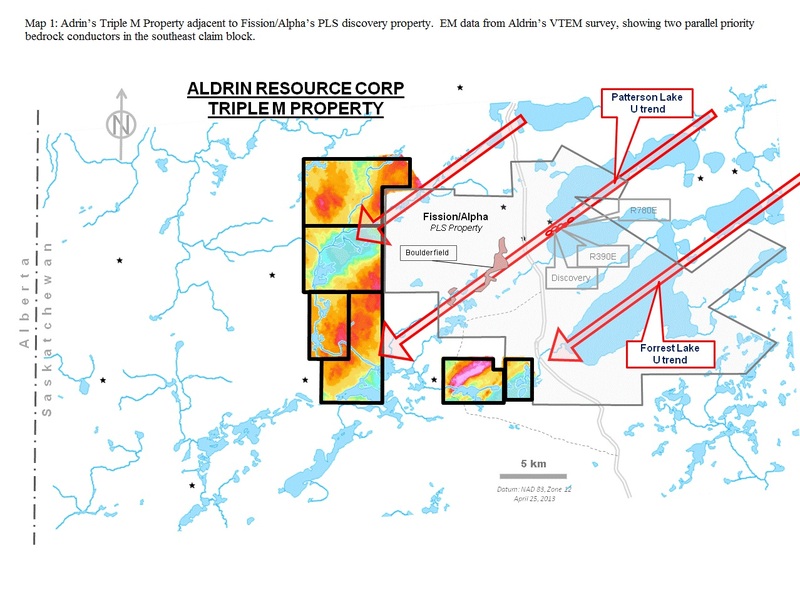 Aldrin Resource Corp. ("Aldrin") is pleased to announce commencement of a ground gravity geophysical survey on the Triple M Property in northern Saskatchewan. The gravity survey is being conducted under contract to Aldrin by MWH Geo-Surveys Ltd., ("MWH"), based in Kelowna, British Columbia. Aldrin's Triple M Uranium Property is located adjacent to and southwest of Fission-Alpha's Patterson Lake discovery property. The ground gravity survey is designed to highlight extensively altered basement rocks associated with Aldrin's already identified bedrock conductive anomalies. Such extensively altered zones are associated with strong uranium mineralization elsewhere in the Athabasca Basin region, and are picked up by gravity surveys as gravity low anomalies. The gravity low results from leaching and replacement of basement rocks by basinal fluids that may precipitate uranium. Gravity low anomalies thus can help prioritize drill targets along the conductive anomalies. Aldrin has developed high-priority drill tar gets on the Triple M Property. The targets are characterized by coincident basement structures, conductive anomalies, radon highs, and relative magnetic lows. Such target characteristics are comparable to high-grade uranium occurrences elsewhere in the Athabasca Basin region, including the spectacular Fission-Alpha discovery at Patterson Lake (the PLS Property). Aldrin's priority targets occur on basement conductive anomalies that were identified by a proprietary Geotech VTEM airborne geophysical survey during the summer of 2013. The two priority conductive anomalies are east-northeast trending linear basement conductors that parallel the Patterson Lake fault and conductor where Fission-Alpha JV has discovered high-grade uranium (Map 1: http://media3.marketwire.com/docs/912660i.jpg). The northern of the two priority conductive anomalies is a very strong and extends 3.5 km. The southern anomaly strikes parallel to the northern, and is modeled as a steeply dipping plane interpreted to be the extension of the Forrest Lake fault as mapped on government geology maps to the east. Both conductors occur within a broad magnetic low trend consistent with fine-grained metasedimentary (metapelite) rocks that host most basement uranium deposits in the Athabasca basin region. This magnetic low trend extends northeast through Fission-Alpha's Patterson Lake property, where high-grade uranium mineralization is hosted in graphitic metapelites. Radon anomalies occur associated with the conductive anomalies. The strongest of the radon anomalies is proximal to the steeply south dipping conductor/Forrest Lake fault extension, with a highest measured radon flux value of 1.68 pCi/m2/s, which is higher than anomalies reported by other properties in the area, including Forum Uranium Corp and the Fission-Alpha PLS property (see Forum news release dated November 14, 2013). Aldrin believes that the basement conductive anomalies, parallel to the high-grade uranium mineralization discovered by Fission-Alpha iron the adjacent PLS property, are priority drill targets. Favourable drill collar locations are highlighted by the existing radon anomalies associated with the basement conductors. Aldrin expects further insight and definition of the drill targets from the gravity survey, which will be completed before the end of December, 2013. Aldrin's CEO Johnathan More states, "We are very excited that our basement conductor drill targets are becoming better defined by our groundwork, first with the radon anomalies, and now with the ground gravity survey." Harrison Cookenboo, Ph.D., and P.Geo., is Vice President, Exploration and Development for Aldrin, and a Qualified Person (QP) by the standards of National Instrument 43-101. He has reviewed the technical data described above and approves the contents of this news release.